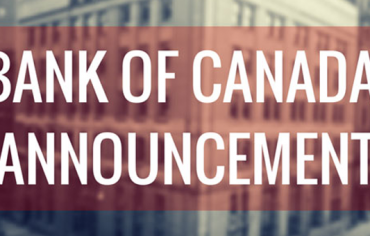 Last week, the Bank of Canada made the announcement that it was keeping the key interest rate unchanged at 1.00%. As predicted in last week’s mortgage update, the global economy made it too risky for Canada to increase the overnight lending rate, despite being in the position to do so financially. 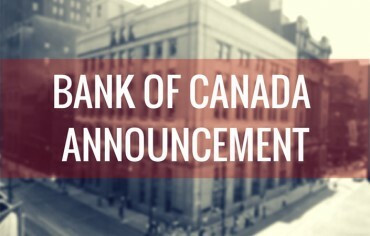 On Wednesday, the BoC’s Monetary Policy Report mentioned several strong factors acting against our economy: the increased strength of the Canadian dollar; growing sovereign default risks in Europe and a deceleration in consumer spending in Canada. The market reacted as Mr.Carney must have expected and the report served as a reminder to the public not to be complacent about low borrowing rates while not inciting any risk to the economy’s recovery . On Friday, Statistics Canada released its CPI which plummeted from 3.7% to 3.1%. Additionally, core inflation dropped from 1.8% to 1.3%. The BoC generally likes this figure around 2% . The CPI (Consumer Price Index) is a good indicator of inflation at the consumer level. So, the slowdown in Canadian consumer spending indirectly affects mortgage rates. Inflation can be kept in check by controlling consumer spending – which is achieved by increasing interest rates. However, if Canadians aren’t spending as much and inflation decreases, interest and mortgage rates are decreased to promote spending and avoid recession-like circumstances. Fixed and variable mortgage rates have remained steady over the last week although Government of Canada bond yields continued their backstage game of fluctuating. Five-year bonds surged early in the week, only to be turned around by Friday’s CPI numbers. So although the week finished 6.5 basis points up, it seems that fixed rates are still pointing down. The CPI and inflation numbers indicate that the predicted short-term rate hikes are unlikely . So if you’re a buyer looking for a fixed rate mortgage, the ball is in your court, at least for the moment. There’s some interesting news for buyers looking for a variable mortgage as well. 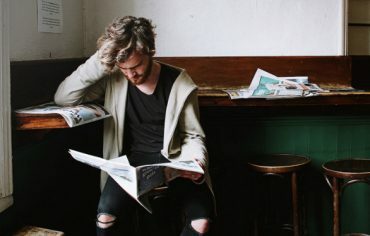 The qualifying rate has now changed and it is possible to use the 3-year posted rate (as low as 3.55%) as opposed to the 5-year rate (5.54%) to qualify . The Qualifying Rate is the benchmark that variable mortgage borrowers need to meet to qualify. This accounts for the risk that is incurred by choosing a fluctuating mortgage rate. The lowest 5-year fixed mortgage rate is 3.49%. The lowest 5-year variable mortgage rates is currently 2.10%. Historical trend of monthly discounted 5-year fixed mortgage rates and discounted 5-year variable mortgage rates from May 2006 to July 2011. Discounted weekly 5-year fixed mortgage rates and 5-year variable mortgage rates from January 2011 to July 2011. 5-year variable mortgage rates make up an overwhelming majority of mortgage products sold on Ratehub.ca in the last week. 58% of mortgage products were 5-year variable. The second most popular product was 5-year fixed at 27%.